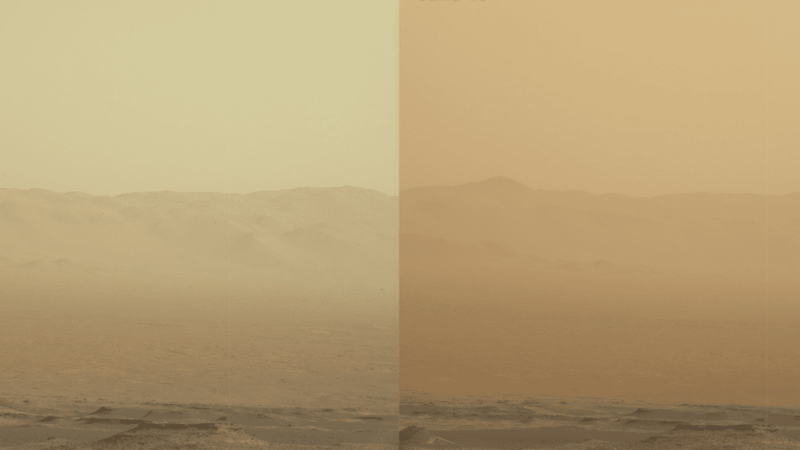 Last week, scientists who watched as the dust storm grew more and more intense responded by reducing Opportunity’s activity levels, to save power generated by the rover’s solar panels. But they kept checking in on a regular basis. But eventually the storm became so intense that keeping even minimal activity was no longer possible. Opportunity stopped communicating with Earth altogether, presumably as a result of a low-power fault. “Our expectation at this point is that the rover has gone to sleep in low energy mode,” Callas says. “The storm is one of the most intense ever observed on the Red Planet,” NASA says. “As of June 10, it covered more than 15.8 million square miles (41 million square kilometers) — about the area of North America and Russia combined. “It has blocked out so much sunlight, it has effectively turned day into night for Opportunity, which is located near the center of the storm, inside Mars’ Perseverance Valley,” NASA says. With no news from Opportunity, the question is whether the little rover that could will make it out of the storm still kicking. There’s no expectation that the rover will be completely buried by dust, but there are risks associated with the lack of temperature control and the extended lack of power. At that point, when the sun returns, the rover should be able to generate more power, recharge its batteries and start back up. Scientists who work with the rover get emotionally attached, Callas says. “The analogy I would use right now is it’s like you have a loved one in a coma in the hospital. The doctors are telling you that you’ve just got to give it time and she’ll wake up, all the vital signs are good, so it’s just waiting it out — but you know, if it’s your 97-year-old grandmother you’re going to be very concerned. And we are. “By no means are we out of the woods here,” he says. There is a possibility that the rover might lose so much power that it can’t maintain its internal clock, which would make recovery more difficult, but still possible. There’s also the risk that a layer of dust will be left over the solar panels, blocking the rover from producing power. Opportunity does not have a mechanism for cleaning its solar panels, but has previously gotten some help from Martian winds. The Mars Opportunity rover has been on the Red Planet for well over a decade — it landed in 2004. Its sister rover, Spirit, fell silent in 2010. As NPR has reported, the aging Opportunity rover has had problems with its memory banks for several years. It also has one arthritic arm (NASA’s term, not ours) and has lost some of its steering capacity. But while the batteries onboard are old, they’re still functioning well, NASA scientists say. “We’re all pulling for Opportunity,” says Jim Watzin, the director of NASA’s Mars Exploration Program. “As you know, it’s been a remarkably resilient rover, lasting 15 years — well beyond its original design life of just 90 days. Scientists say that while the storm threatens the rover Opportunity, it is an opportunity itself — a chance to learn more about dust storms on Mars. That’s helpful both for understanding the storms in general, and also for preparing for human trips to Mars.